Kick Off 2 was one of our favourite games while we studied (and got drunk) at college. It was always a great laugh playing tournaments and trying to put one over your mates. 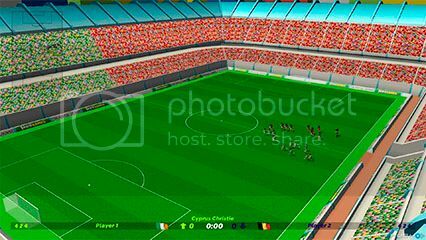 Kick Off 2 was one of those games that you had to play consistently to get good at it, as the ball wasn’t stuck to your feet like other football games that were out at the time. 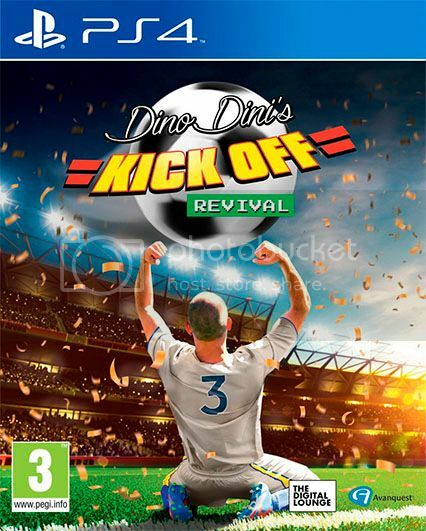 With the series’ original creator Dino Dini returning for this reimagining, we had high hopes that Dino Dini’s Kick Off Revival would be a fun, nostalgic return for the series. But does the franchise make a triumphant comeback, or is it more akin to the current England team, who slunk back home after a lacklustre Euro 2016 campaign? The graphics aren’t exactly groundbreaking in Kick Off Revival. When you first load up Kick Off Revival you are greeted by some cheesy music that harks back to the original games, and are given just two options: Play and Practice. Practice mode is meant to give you a good grounding in how to play the game. Kick Off Revival uses a simple one button system that lets you pass, shoot, tackle, head the ball etc by pushing just the one button, but practice mode really doesn’t give you any pointers on how you play the game. Your team is simply put on the pitch, and you go to several marked areas to perform moves like scoring from the centre circle, making so many passes in succession etc. The annoying thing is the game doesn’t give you any clues on how to do these moves, and with it having a time limit, it’s a bit of a struggle to complete the manoeuvres in time. With the lack of instruction it takes a while to learn the ropes, and when we started playing it felt chaotic, with the ball pinging around the pitch at speed and you having little control over the ball and what’s happening on the screen. Eventually we found out that holding down X triggers strafe mode, which let us trap the ball and gain a bit of control; although when you do this you’re stuck in the same position you are facing when you move around, and you can’t run as fast. Tackling is quite hard to time correctly due to the speed of the game, and when you do a tackle you slide for an age across the pitch leaving a huge furrow that a farmer would be proud of. Bizarrely the referees don’t hand out yellow and red cards, which means you can tackle like Vinnie Jones all through a game, without fear of being reprimanded. You also have no control over goal kicks, with the goalie just hoofing the ball up the park. The one button control system can also cause problems, as sometimes you want your player to, say, pass the ball, but he ends up doing a sliding tackle at the ball, which makes you lose possession. While the control scheme worked in the past, perhaps an alternative option could have been given to make use of the modern controller and different button configurations. With a bit of time spent playing though, it gradually started to click, and it felt like we’d been transported back 20 years to our college years again. The European Cup is basically Euro 2016 by another name. The Play menu contains the main game modes, which include local two player friendly, single player friendly, and Netplay, which lets you challenge players online. 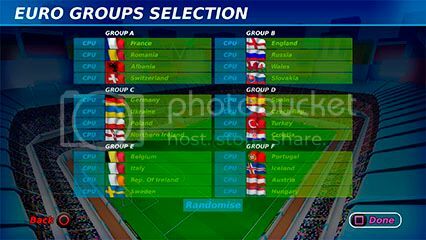 There is a tournament option called European Cup, which lets you play out the current Euro 2016 competition, or you can randomise the teams in the groups. It’s disappointing that the game only includes European international sides at present, with no club sides or tournaments. As an extra kick in the teeth for Scottish fans, Scotland apparently didn’t make this fictional tournament either! Obviously licensing issues have meant that the teams use fictionalised names that sound like the real players much like Pro Evolution Soccer, but unlike PES there is no way to edit them which is a major drawback. There is also no way to create your own cup or league competitions with customised options, which means you are stuck with playing the European Cup mode. This is the main problem with the game, as some of the things that have been promised later like penalty shootouts for cup games and red and yellow cards, should really have been in the game from the start. We can’t help but feel that the game should have spent a little bit more time in development before release, to add a few features to help bolster its longevity. Online games can get frantic, as you can see with the number of skid marks on the pitch! While the options are light, the gameplay is a nostalgic dream for players of the original games. It’s fast and frantic, and it’s still oh-so-satisfying when you curl a banana shot into the top corner of the net. Fans of FIFA or Pro Evolution Soccer will have a very hard time trying to play Kick Off Revival, as it’s not the most accessible or easy game to play, and they will struggle with the lack of content. Some of the AI is also suspect at times, with our goalie putting the ball in his own net at one point, and another of our players started doing celebration somersaults after scoring an own goal! The online multiplayer in Kick Off Revival seems to work pretty well, and matchmaking didn’t take too long. The games we took part in did seem to consist of players tearing up the pitch in bruising encounters, but it was still an enjoyable slugfest. There is an online leaderboard which shows you the top 30 Kick Off Revival players online, but it doesn’t show where you are in the global rankings, so you have no idea how well you are doing, unless you are in the top 30 players in the world of course! Gameplay is fast and frantic, and can take an age to master. Dino Dini’s Kick Off Revival is rough around the edges, and we can’t help but feel that it has been rushed out to cash in on the Euro 2016 buzz. Creator Dino Dini has mentioned that there will be patches and free DLC to help complement the game, and it is something that is much needed, as the game as it stands is bare bones and has a few glitches and dodgy AI that hamper the experience. At the moment Kick Off Revival has potential, and fans of the originals will enjoy the nostalgic blast from the past; but we just feel you’d be better off waiting until it has been patched and extra content has been released before you consider buying it.